The Conn Smythe Trophy is an annual award given to the most valuable player for his team in the playoffs. The winner is selected by the Professional Hockey Writers' Association at the conclusion of the final game in the Stanley Cup finals. The Smythe Trophy was presented by Maple Leaf Gardens Limited in 1964 to honour Conn Smythe, the former coach, manager, president and owner-governor of the Toronto Maple Leafs. (Born: February 1, 1895 in Toronto, Ontario-Died: November 18, 1980 in Caledon, Ontario) was a Canadian builder in the National Hockey League. One of the more competitive and colourful characters in NHL history, Conn Smythe built the New York Rangers, Toronto Maple Leafs, and Maple Leaf Gardens. He was a fearless leader as a major on the battlefield in both world wars and took no prisoners when making the Maple Leafs one of the league's powers. The Toronto native attended the University of Toronto where he graduated with a B.Sc. in 1920. He first gained prominence in hockey as a centre who led the Varsity Blues to the 1915 Ontario amateur championship. Smythe later led U of T to the Allan Cup in 1927 and formed the Varsity Grads team that went on to win the Olympic gold medal at St. Moritz in 1928. Smythe's first taste of the NHL came with the New York Rangers. The canny manager acquired Bill Cook, Frank Boucher, Ching Johnson, and Taffy Abel, moves that formed the core of the 1928 Stanley Cup champions. After a disagreement with management, Smythe bought the Toronto St. Pats and renamed them the Maple Leafs on February 14, 1927. 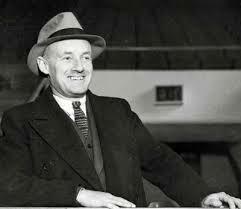 During the 1931-32 NHL season, he and associate J.P. Bickell financed the construction of Maple Leaf Gardens. Later that year the franchise won its first of eleven Stanley Cups as the Maple Leafs. Passionate about horse racing, Smythe helped build his team by purchasing Ottawa Senators star King Clancy with winnings from a bet. Smythe served as Managing Director and President of Maple Leaf Gardens Limited and oversaw one of hockey's greatest dynasties when Toronto won five Stanley Cups between 1945 and 1951. He retired as one of the greatest architects the league had ever seen. Smythe was also a tireless promoter who brought entertainment, meetings, rallies and royalty to The Gardens. He was also heavily involved in such charities as the Ontario Society for Crippled Children and minor hockey development throughout the province. Smythe also personally supervised the construction of the Hockey Hall of Fame building in Toronto in 1961. The National Hockey League honoured Smythe's contribution to the game by introducing a trophy in 1965 to be presented to the Most Valuable Player in the Stanley Cup playoffs. The league also named one of its four divisions after him prior to the 1974-75 season. One of hockey's greatest builders, Smythe was inducted into the Hockey Hall of Fame in 1958. He was famously quoted as saying: If you can't beat em in the alley, you cant beat 'em on the ice. He is interred at Park Lawn Cemetery in Toronto.